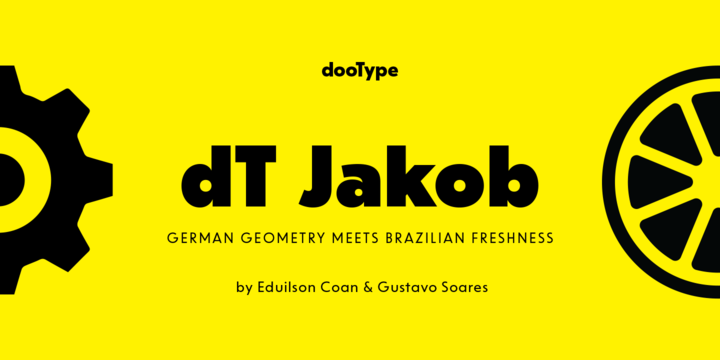 dT Jakob is a geometric sans serif typeface created by Eduilson Wessler Coan together with Gustavo Soares and published by dooType which has extensive weght range with matching italics. You can access everything through the OpenType, all alternates. Also is available various figures, for various needs and 2 sets of arrows. This robust and versatile typeface is suitable for both display and text typography. Cannot miss it! Price: starting from $30,00 for one font to $180,00 for all 14 fonts. A font description published on Friday, September 22nd, 2017 in dooType, Eduilson Wessler Coan, Fonts, Gustavo Soares by Alexandra that has 1,744 views.